As east Oxford's residential area developed, the need for another church grew, particularly in the Robin Hood area (between Magdalen Road and Howard Street). Religious services and instructions had been carried out in the school room of the Robin Hood School since it opened in 1868. A Mission Room on the corner of Catherine Street and Howard Street, used from 1887 to 1889, was the first step to a new church. A site on the corner of Catherine Street and Charles Street was purchased in 1892 and St Alban's Mission Church, a small brick building, was opened on 30 May 1889. Originally the room was screened across the chancel and doubled up as a boys' junior school on weekdays until the school site at Hertford Street was completed. A corrugated iron room was added in 1912. In October 1913, Father Cecil Scott bought, for �610, an existing chapel and adjoining house at 60, Percy Street for use as a church hall and parsonage. [It had been built in 1898 by U.V. 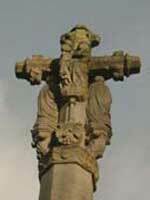 Herford, minister of a congregation that was originally Unitarian - see Fact sheet 10 on other churches]. 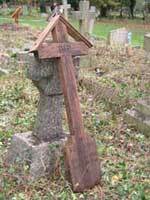 The first resident priest was Father RG Milleridge who is listed in the 1914-15 edition of Kelly's Street Directory as the priest in charge of St Alban the Martyr. He took over from Father Brown, the retired Principal of St Stephen's House, then living in Norham Gardens. St Alban's began to function almost as a separate parish under Father Norman Hayward (1922-1925), managed its own finances, had an Entertainment Committee and its own Sunday School Outing. His successor, Father Richard Lewis (1926-1929), started the St Alban's Scouts, raised money for a new church (on the site of the Mission Church) and commissioned Lawrence Dale to design a building for 390 people. 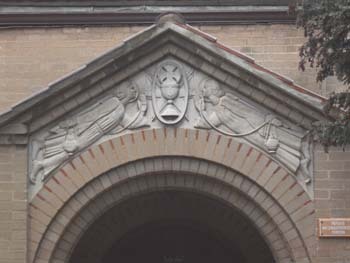 The� angels at the entrance to the church were carved by local artist John Brookes who went on to become principal of the Technical College in Cowley Road. Oxford Brookes University is named after him. 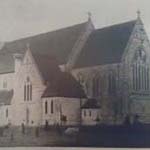 David Fisher, a parish church warden, commenced work on the new St Alban's Church building on 31 May 1932 and the church was consecrated on 1 May 1933. 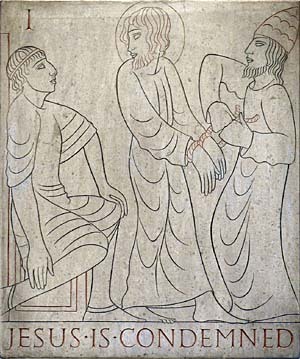 It contains a notable series of panels depicting the Stations of the Cross by the sculptor and typographer Eric Gill. It remains an active church within the Parish of Cowley St John. Christopher Hibbert (ed), The Encyclopaedia of Oxford, (London: Macmillan, 1988). Susanne Shatford and Trevor Williams, The Changing Faces of St Clements and East Oxford, Book One, (Witney: Robert Boyd Publications, 1997).